The Federal Reserve’s portfolio of Treasury and mortgage-backed securities has more than quadrupled over the past decade. In June, the Fed announced a plan for beginning to shrink the balance sheet, and most market participants expect the Fed to pull the trigger on this process at its September 19-20 meeting. Currently, the balance sheet stands at over $4.5 trillion, much larger than its pre-crisis peak of around $925 billion. How did the balance sheet get so big and why does the Fed want to shrink it? And to whom does it matter? What is the Fed’s balance sheet? Like any entity, the Federal Reserve has liabilities (mainly money that commercial banks have deposited at the Fed plus outstanding currency) and assets (mainly U.S. Treasury debt and mortgage-backed securities.) What makes the Fed unique is that it can expand its balance sheet at will by (electronically) printing money (technically, bank reserves) and using that money to buy Treasuries in the open market. Details of the Fed’s $4.5-trillion balance sheet are posted online by the Fed. How has the Fed’s balance sheet changed? Until the global financial crisis, the Fed’s balance sheet was growing gradually along with the rising amount of currency used in the economy and fluctuating only a bit as the Fed bought and sold short-term Treasury securities to keep short-term interest rates near its target. That changed in 2008 when the Fed cut short-term interest rates nearly to zero and recognized that wasn’t enough to restore the U.S. economy to health, and it needed a way to lower longer-term interest rates and stimulate spending. It embarked on a monetary experiment now widely known as “quantitative easing” (QE): buying Treasury bonds and mortgage-backed and US agency securities in the open market. As a result, the Fed’s balance sheet has become much larger than any time in history, both in total dollars and measured as a percentage of the U.S. economy. The assets on the Fed’s balance sheet have more than quadrupled since the start of the crisis. The first round of quantitative easing, QE1, began in November 2008 and expanded in March 2009. In QE1, the Fed purchased a total of $1.25 trillion in mortgage bonds, $200 billion of debt issued by government-sponsored mortgage companies Fannie Mae and Freddie Mac, and $300 billion of long-term Treasury securities. In QE2 which began in November 2010, the Fed bought another $600 billion of long-term Treasury securities. The third and final round began in September 2012 with an open ended commitment to buy another $40 billion per month of mortgage bonds until the economy recovered and in December expanded that with $45 billion per month of Treasury bonds. By the time QE3 ended in October 2014, the Fed had added another $1.7 trillion to its portfolio. As noted, the Fed’s purchases of long-term securities were intended to lower long-term interest rates after the Fed had already cut short-term rates to zero. How much did QE move longer-term rates? According to studies by academic and Fed economists, long-term Treasury and mortgage rates are about one percentage point lower than they would have been without QE; the effect of corporate bond yields was somewhat smaller. The Fed’s actions also signaled to the public and financial markets that the Fed intended to make credit readily and cheaply available until the economy was fully recovered from the Great Recession. How does the Fed’s balance sheet compare to that of other major central banks? Before the crisis, the balance sheet was larger than that of the Bank of England’s, measured against the size of each country’s economy, but smaller than that of the European Central Bank or the Bank of Japan. Since the crisis, the other major central banks also have pursued quantitative easing, swelling their portfolios. As of July 2017, the Bank of England’s balance sheet was, again measured against its economy, similar in size to that of the Fed, but the ECB’s – which is still adding to its holdings – is substantially larger. 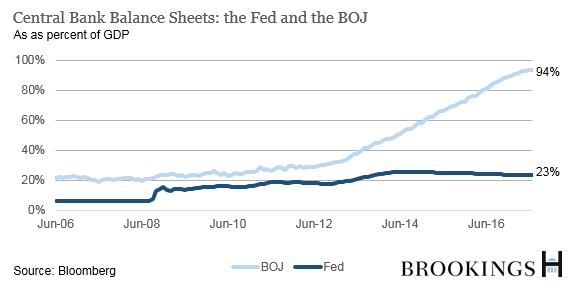 The Bank of Japan however, has a significantly larger balance sheet relative to its economy than any other central bank. As a result of persistently low inflation (sometimes even deflation) in Japan since the 1990s, the BOJ was the first central bank in the world to experiment with quantitative easing back in 2001. When Haruhiko Kuroda became governor of the BOJ, he expanded the BOJ asset purchase program. As a result, the BOJ’s balance sheet is now over 94 percent of Japan’s GDP. The Fed’s is 23 percent of U.S. GDP. Does the Fed have to sell all the bonds it bought during the financial crisis? No, and it probably won’t. Even though the Fed is talking – a lot – about gradually reducing the balance sheet, it doesn’t have to and probably won’t sell any of the securities it has purchased. Moreover, the balance sheet is unlikely to return to its pre-crisis size. In Congressional testimony in July 2017, Fed Chair Janet Yellen noted that the FOMC “anticipates reducing the quantity of reserve balances to a level that is appreciably below recent levels but larger than before the financial crisis.” John Williams, president of the San Francisco Fed, has said that, “It should take about four years to get the balance sheet down to a reasonable size. While we haven’t settled on what that exact number will be, it will be quite a bit lower than today.” Projections from the Federal Reserve Bank of New York put the final level of the balance sheet somewhere between $2.4 trillion and $3.5 trillion. There is no consensus about what the size of the Fed’s balance sheet should be in the long-run. In a recent blog post, our colleague and former Federal Reserve Chair Ben Bernanke explored why it might make sense to keep the balance sheet relatively large. He notes that at a minimum, increased demand for currency and reserves dictate a larger balance sheet than before the crisis, regardless of decisions about the overall conduct of monetary policy. The question is whether the balance sheet should be even larger than needed to handle this natural growth—that is, whether the Fed should leave extra reserves in the banking system and not go back to the minimal approach to bank reserves it used before the crisis. Bernanke and others favor keeping the balance sheet somewhat larger, supported by research that suggests a larger balance sheet increases the supply of safe assets in the economy (crowding out the private provision of “safe” assets that turned out to be far from safe in the crisis) and also improves the effective transmission of monetary policy. Others have criticized the Fed for printing extra money to finance the national debt, or for subsidizing the housing sector through its purchases of mortgage-backed securities and agency debt. The argument goes that the independent Fed should have a small footprint in the markets and unelected officials at the Fed should not be choosing where to allocate credit, essentially engaging in fiscal policy that should instead be implemented by Congress. If it isn’t going to sell bonds, how will the Fed reduce the balance sheet? Since October 2014, the Fed has kept the balance sheet stable, reinvesting all proceeds from maturing bonds and mortgages. That is likely to change soon. At its June policy meeting, the FOMC unveiled a plan for reducing the balance sheet gradually by not reinvesting the proceeds of all maturing bonds. By talking a lot about this plan in advance, the Fed hopes the change will not disrupt financial markets, though it will likely push up long-term interest rates over time. Estimates from the bond market committee that advises the Treasury and from economists at Deutsche Bank suggest that yields on U.S. Treasury bonds will rise by an additional 0.4 to 0.56 percentage points after the Fed reduces the size of its balance sheet. (As of August 17, the yield on 10-year Treasuries is about 2.18 percent.) As a result, homeowners will pay higher rates on their mortgages and corporations will pay more to borrow. However, for the Fed these results will be consistent with its efforts to withdraw the unusual stimulus it put in place earlier now that the labor market is back to, or even a bit below, estimates of full employment and inflation is projected to rise to the Fed’s target of 2 percent.